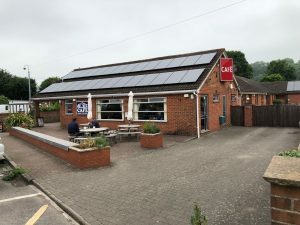 The Hillside Café is on the A36 in the Wylye Valley in Wiltshire, close to the A303 Salisbury to Exeter main road and close to several major towns – for example it’s eight miles from Warminster, nine miles from Longleat, 12 miles from Stonehenge and 14 miles from Salisbury. 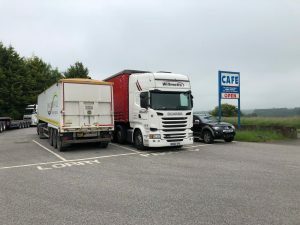 You only have to see the number of trucks parked to see it’s popular with truckers, and a Full English will soon highlight why it’s popular! 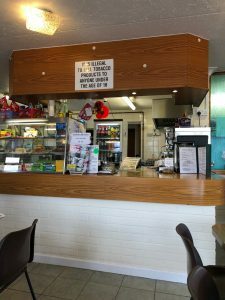 The cafe is privately ownedby Ian and wife Terry who have run the business for over 30 years. As well as truck drivers, families are always welcome. 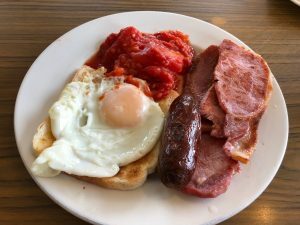 The big breakfast is £7.15 and comprises of two rashers of bacon, two sausages, two eggs, beans, fried bread, tomatoes, bread and butter and a mug of tea. For £8.50 you can have fried potatoes added. The English breakfast is two rashers of bacon, egg, sausage, fried bread, beans or tomatoes, bread and butter and tea. The sausage breakfast – at £5.55 – has two sausages and two eggs as well as fried bread, beans or tomatoes, bread and butter and tea. There are extras such as fried potatoes at £1.85, mushrooms, hash browns, black pudding or bubble & squeak – all at £1.15. Bacon, egg and fried bread is £3.50, or with beans added, it costs £4. Bacon, egg and sausage or beans is £3.65 while bacon, egg, sausage and beans is £4.25. Bacon or sausage with eggs are both £3.15 and bacon, egg and tomatoes is £3.65. Bacon, egg, sausage and fried bread is £4. For lighter breakfasts, then the Hillside café has a good selection. Scrambled egg on toast will set you back £3.50 – and with bacon, it is £5.50. Egg or beans on toast costs £3.50 while double cheese and poached eggs on toast is priced at £5.50. Bacon and egg on toast costs £4.40. Fried or poached eggs, cheese or beans on toast is £2.40 and all can be doubled up at £3.50. Mushrooms on toast is £2.75. Additionally, two slices of toast is £1.50 and with the added extra of marmite or marmalade adds 30p to that. There is a wide range of sandwiches and rolls on offer, and bacon or sausage in a roll is £2.55, or with an egg it is £3.30. Bacon and mushroom together cost £3.70 while sausage and onion is £3.10. A fried egg roll is £2.30 and bacon and sausage as a pair costs is £4.15. Egg mayo salad is £3.75, ham salad is £3.95, plain ham is £2.50 as is corned beef. At £3.05 are roast beef, roast chicken or roast lamb. A hamburger roll is £2.70 while a cheeseburger is £3.45. An egg burger roll is also £3.45. A cheese roll is £2.75, and with tomato added it is £3.25. Chicken in a bun with lettuce and mayo is £3.45. A simple hot pie or pasty on its own will see you forking out £2.75. Many of the main meals kind of morph from the breakfast options, but there are the traditional favourites that truck drivers like. Main meals start with the likes of eggs, chips and beans which costs £4.50, while the more extravagant bacon, egg, sausage, hamburger, chips and beans is £7.80. In between there are sausage or bacon, egg and chips at £5.20. With beans added it’s £6.20. Shepherd’s pie with chips and beans is priced at £5.50, as is ham, corned beef or burger with egg and chips. That is also the same price for a pasty or steak and kidney pie with chips and beans £5.50. Chicken in a bun with chips is 25p more at £5.75 while a burger in a roll with chips and beans is £5.90. A roast beef, chicken, or lamb lunch will set you back £6.50 as will steak and kidney or shepherd’s pie, and all served with mash, roast spuds, cabbage, peas, carrots and gravy. There is also a vegetarian lunch – which includes mushrooms instead of meat and is available with or without gravy, again at £6.50. It’s good to see more truckstops offering a vegetarian option, an even if the choice isn’t amazing, it’s at least progress. Finally, for fish fans, plaice, cod or haddock with chips, peas or beans is also £6.50. 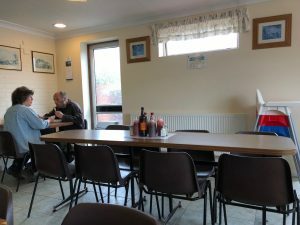 There is also a veggie grille – egg, fried potatoes, beans, mushrooms, bubble & squeak for £6.70 while bacon, egg, chips, sausage and beans is £7. A gammon steak, with egg, chips, pineapple, beans, peas or tomatoes is priced at £7.50. There is also a range of homemade curries – served with rice or chips – chicken tikka, beef madras or chicken korma, and also chilli con carne is on the menu. There are also salads on the menu – ham, beef, cheese, lamb or corned beef – all served with cucumber, tomatoes, lettuce and beetroot. These can be with pickles and boiled egg at £6.25, or with chips, rice or boiled potatoes at £7.50. Omelettes are available with ham, cheese or mushrooms – and served with chips, peas or beans are priced at £6.25. The Hillside offers the classic favourites when it comes to desserts such as fruit crumbles, sponge puddings, treacle tarts and bread pudding – and all served with custard or ice cream and priced at £2.75. Mixed fruit and ice cream, ice cream or rice pudding are also available at £2.75. A mug of tea is £1.30 while coffee is £1.50. Hot milky coffee or hot chocolate are both £1.75. It also sells bottes of soft drinks, water and the like. There is capacity for 50 diners, but there are also picnic tablesoutside. There is free parkingfor cars, lorries and vans. Countrywide Autogasis also available at the café which also has free Wi-Fi. There is not a lot of room for parking, about ten trucks can get in, and it costs £7 a night to park. The café is open Mondays to Fridays from 0600-1400, but is closed on Saturdays and Sundays. This is a nice place to eat, the food was good, and service was brisk, and with a smile. The staff were helpful and it is a highly recommended place to stop. For parking up, just be warned about the limited capacity and the fact you can’t get an evening meal.